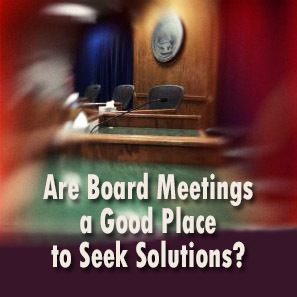 Alabama School Connection » Are Board Meetings a Good Place to Seek Solutions? In the past few weeks, we have heard many stories of the public’s frustration with their board of education erupting into tension-filled boardrooms. Typically that happens during the “public comments” or “public participation” section of the meeting. This one was in Hoover, where parents are frustrated with what school officials admit is an attempt to engineer racial and socioeconomic parity among schools, with what the community perceives to be little concern about the effect that moving children from school to school has on children and established communities. This one in Montgomery, where frustrations boiled over at a recent board of education meeting, resulting in security officers escorting citizens from the building and a reporter being asked to serve as a witness to statements made. An MPS security guard is now asking that I be a witness to say he didn’t threaten Brown. I think I’m in this deeper than I want already. This board’s rigid rules for public participation, in Madison County, nearly kept the incoming superintendent from being able to address the board at a public meeting. The continued questioning has resulted in one board, in Huntsville City Schools, restricting who is even allowed to speak from the podium. Huntsville City Schools’ Board of Education just enacted a geographic-based rule, only allowing citizens living within Huntsville’s city limits to speak to the board on a non-agenda issue at a board meeting. One board member stated that citizen comments were interfering with the work of the board. The President of the board made reference to the change in rule being needed due to “folks from outside this area”, a.k.a. outside agitators, having an “ulterior motive to try to come down and bring negative, false, negative information into the conversation.” Here’s the video. See for yourself. When asked about whether the restriction applies to teachers and other employees who live outside of the city, Board President David Blair said he expected teachers to follow the proper channels to have their problems addressed, thus teachers shouldn’t need to address the board. But that only addresses the folks who have children enrolled in or are working in the city’s schools. What about the 70% of residents (average) who don’t have a personal daily connection to the schools? Blair clearly stated the Board always wants to hear from citizens, from stakeholders, from those who live in Huntsville. When a question was read aloud asking how a policy could be enacted that limited comment to only Huntsville residents considering Huntsville City Schools is funded with state and federal money as well, the response from Blair was simply that it is not a policy, it is just the board setting its own rules for the meeting. Which wasn’t really an answer, was it? For the record, local revenue makes up less than 41% of the total $277.5 million in revenue that Huntsville City Schools has budgeted for FY15. How then, is it possible, for the board to shut out the voices of those who provide the other 59%? Simply put, it is possible because each board has the authority to set its own rules for public participation. The public’s engagement interfered with the work of the public school board. Interesting commentary from a five-time president of the Huntsville PTA and current candidate for Huntsville City Council. Don’t look to state or federal law for a requirement to allow the public to address the board of education. Because the Alabama Open Meetings Act, which governs public meetings in section 36-25A of the Code of Alabama, only gives the public the right to attend and observe. OPEN OR PUBLIC PORTION OF A MEETING. The open or public portion of a meeting is that portion which has not been closed for executive session in accordance with this chapter, for which prior notice was given in compliance with this chapter, and which is conducted so that constituents of the governmental body, members of the media, persons interested in the activities of the governmental body, and citizens of this state could, if they desired, attend and observe. Simply put, there is no state-given right or law mandating that the public be allowed to address a board of education at a public meeting. Every board of education makes that determination. It’s Just the Podium…..Or Is It? During the struggle to save Hoover’s buses last year (in which I was intimately involved; as the saying goes: always take care of your own house first), there were many attempts by the Hoover Board of Education to limit public participation at board meetings. At the January 2014 meeting, the struggle literally was over where the podium would be placed (see the links within the post as well). The video portrays a dramatic attempt to control how the public participates in a board meeting. The following month, long-time school board attorney, Donald Sweeney, advised the Hoover Board of Education not to even answer questions from the public during the board meeting. Here’s al.com’s report on that event. As a result, the board talks at the public, and in turn, the public talks at the board. There is no dialogue, no conversation. At least not during the meeting. It all seems like a silly exercise, doesn’t it? All of these actions beg the question: why are boards working so hard to keep the public away from the podium? Particularly when State Superintendent Dr. Tommy Bice, the Alabama Association of School Boards and even the National School Board Association are desperately trying to re-engage the public in public education. Do they push the public away because they know they do not have the authority to appropriately resolve the problem? Have boards of education been rendered impotent due to the continuing shift of power to the superintendent? Remember, boards of education can only act on recommendations from the superintendent. A board member can only vote a superintendent’s recommendation up or down at a board meeting. If a citizen is looking to influence a vote, isn’t it likely that board members’ minds are made up prior to entering the boardroom for the meeting? Public participation usually comes after a vote on agenda items anyway. The only action a board can take without the recommendation of the superintendent is to fire the superintendent and/or fire the Chief School Financial Officer. Why Should the Public Bother Attending a Board Meeting If They’re Only Allowed to Sit and Listen? Families are busy. Boards shouldn’t expect families to make time to sit and listen and leave frustrated. Does a school board really need an audience at all if they are unwilling to listen and respond to members of the public that make the time to attend? Is this an attempt at the deliberate exclusion that Dave Meslin speaks of in ‘The Antidote to Apathy‘ (embedded below)? If there are no formal paths for authentic citizen deliberation about our public schools, what should citizens who care about what’s happening in our public schools do? If the public needs to bring something to the board’s attention, is the board meeting the appropriate place to make that happen? Should there be an alternate vehicle through which the public can call attention to concerns and seek solutions for problems without being hamstrung by board meeting procedure? What boards of education may be reluctant to recognize is that public discussion of problems in our schools will happen with or without the board’s permission. Many communities are developing alternate ways to communicate about problems, including setting up Facebook groups and Facebook pages. Some communities in Alabama are having vibrant, healthy, albeit occasionally tense and emotion-filled, discussions about what’s happening in their schools. This type of public deliberation to find public solutions for public problems in public schools is exactly the type of deliberation that David Mathews wrote of in his book, Is There a Public for Public Schools? a must-read for every school board member and citizen interested in strengthening our public schools. Mathews is a former president of the University of Alabama, current president of the Kettering Foundation, and the person for whom the David Mathews Center for Civic Life in Montevallo, Alabama, is named. His research clearly demonstrates the need for the public to own their public schools, and deliberation is part of that ownership process. When the public is asked merely to buy in to what educators are selling (the current model of engagement at board meetings), the public becomes disinterested and only re-engages when they perceive educators to be selling them something they don’t want to buy. And that’s typically when the public shows up at a school board meeting angrily looking for answers. Joe Mathews, California and Innovation editor at Zocalo Public Square suggests setting up public meetings to look more like a Starbucks than a formal chamber. Cool idea. Here’s another article from Zocalo, by Pete Peterson, about how public boards and councils can set up their meetings if they truly want the public to engage. Among the suggestions: engagement had better be a two-way conversation, and go to where your residents are. The article is a simple read and worth your time. The public, even here in Alabama, seems determined to seek solutions for our children and strengthen our public schools. The farther boards of education push citizens away, the more determined some become. If school board meetings are not the place to seek solutions in your community, let’s create new places, new spaces, to have those deliberations. Yes, I know I asked a lot of questions in this post, but these are all questions school boards and the public should be asking ourselves as we continue moving forward. Thanks for reading. The Antidote to Apathy – Dave Meslin, TedX. Meslin makes a case that public bodies are intentionally excluding the public by making public work cumbersome, difficult to access, and elusive. He lays groundwork for fostering more public engagement. The video is 7 minutes long. Please take the time to view the video. People have forgotten the early history of public education in the United States. People see education as a service that is provided rather than as something they are a part of. Unfortunately, much of Kettering’s research today points to people feeling shut out of the education of young people. They say, “those aren’t our schools.” But the truth is, at one point, they were intimately theirs. We can’t return to a time when individual citizens build the schoolhouse and hire the teacher, of course, but some amount of school ownership seems not only appropriate but also necessary. 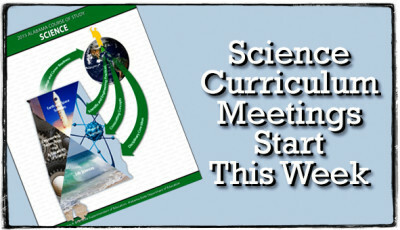 For many people, educating may be something that primarily happens in schools. And for those who do not have children or whose children are grown, this may be something that doesn’t seem all that important. But some people do recognize that education is not just the responsibility of parents and teachers—the whole community must be involved. Historically, this was certainly the case. We understand that change doesn’t happen from the top down, so we make a conscious effort to raise up the voices of those impacted by education policy. Too often, the schools debate consists of the same back-and-forth gobbledygook among assorted talking heads and elected officials, while parents, students and teachers are sidelined as hapless victims. That doesn’t clarify things. Too often it confuses it. We make a conscious effort to show grassroots work as equally positive and powerful forces of change and impact. People aren’t excluded from shaping the future of schools. Our engagement is the future of our schools. Civic capacity is about various sectors of the community coming together in an effort to solve a major problem. In our case that problem was our public schools. In Mobile, history had proven that education reform was not rocket science, but, very definitely political science. Researchers, educators, and reformers alike knew what sustainable reform looked like. The missing ingredient had been the public. Reforming public schools is a political act, particularly if we are to achieve the levels of social equity and well-being to which we all aspire. So many of the solutions rest in the political realm at local, state, and national levels. Traditionally, for us, the public had been called upon to support public education, either by voting in additional revenue or volunteering in the classroom at the local school. They had been asked to participate in certain activities rather than as true partners and owners of the school system. The chart below, depicting the Public Participation Spectrum, was created by IAP2. Where along the spectrum of participation does your district engage? 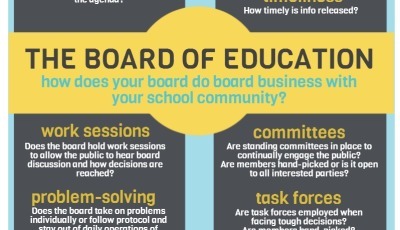 How Does Your Board Do Board Business with Your Community?